How do I set up Disk Quotas on my D-Link DNS-321/323/343 Storage? The ShareCenter supports storage quotas for both groups and individual users. 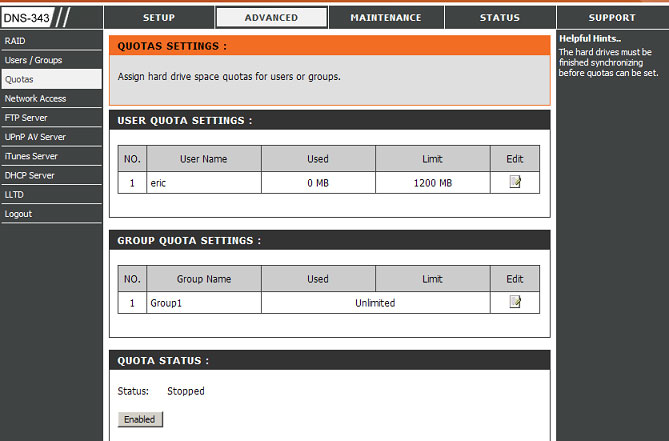 Assigning a quota to a group or user will limit the amount of storage they are allocated. By default, users and groups do not have a quota. Step 1: Log into the ShareCenter. The default username is admin (all lower case) and the default password is blank (nothing). Click on Config. Step 2: Click on the Advanced tab at the top and then click on Quotas on the left-hand side. By default, all users and groups are displayed on the Quota Settings page. Users and groups are automatically listed on this page, and cannot be deleted. The default quota setting is Unlimited. Step 3: Click the notepad icon of the user you want to add a quota to. Step 4: Set a quota amount (MB) for the user and click Apply. The user, their amount of storage used, and their storage limit will noe be displayed under User Quota Settings. Step 5: Click Start at the bottom of the page to start the service. How do I setup E-mail alerts on D-Link DNS-321-323-343 Storage? Step 1: Log into the ShareCenter configuration web interface and click the Tools tab and select E-Mail Alerts on the left side. Step 2: Select either Account or Anonymous. Note: Anonymous does not require a User Name or Password to be entered however you must check with your ISP or Email service if anonymous emailing is allowed. Step 3: Enter the appropriate user name and password for your e-mail account. Step 4: Enter the IP address or domain name of your outgoing mail server in the SMTP Server field. If you are unsure of this value, contact your e-mail provider. Step 5: Enter the from e-mail address (e.g. alerts@dns323.com) in the Sender E-Mail field. This field does not require a valid e-mail address. However, if your e-mail client is filtering spam, make sure you allow this address to be received. 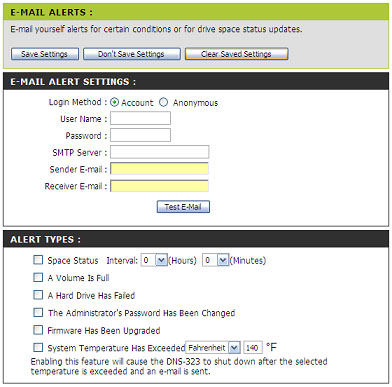 Step 6: Enter the e-mail address you want to send the alerts to in the Reciever E-Mail field . This address must correspond with the SMTP server configured above. Step 7: Test the E-Mail Alert by clicking the Test E-Mail button and confirm your settings are correct. Step 8: Select your E-Mail Alert Types you want to be sent to you and click Save Settings at the top of the menu. Note: If E-mails notification fail to send please verify the unit has the proper DNS settings in the LAN configuration. How do I upgrade the firmware on my D-Link DNS-321-323-343? **WARNING** Read Before Upgrading Firmware. New firmware for the DNS-323 often affects the way hard drives are formatted and the way files are handled. To avoid potential complications and loss of files, please back up all files to another location before upgrading firmware. After the upgrade, re-format your hard drives if upgrading from Shipping firmware 1.00 or 1.01 and if hard drives are formatted in EXT3. Once the hard drives have been re-formatted, it will be safe to move your files back onto the DNS. 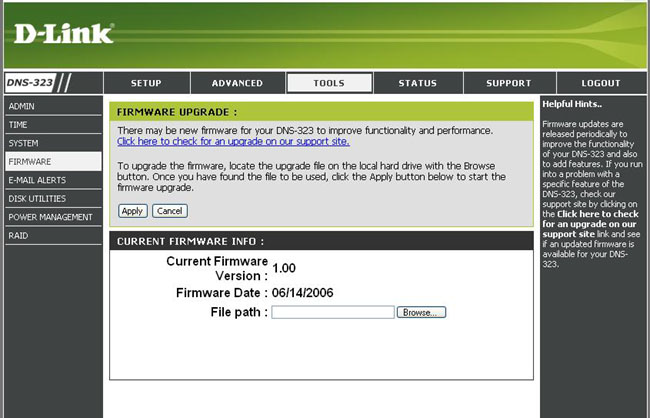 Step 1: Download the latest firmware from http://www.dlink.com. Step 2: Once you’ve downloaded the firmware, open a web browser and log into your D-Link DNS-323. Step 3: Enter your username (admin) and your password. Click Configuration to enter the web configuration for the device. How do I map a drive using the Easy search utility with D-Link DNS-321/323/343? The Easy Search Utility makes it simple to map drives to your computer. To get started, insert the DNS-321/323/343 CD into your CD-ROM and launch the Easy Search Utility. Step 1: Select an available DNS-321/323/343. Note: Available volumes will be displayed under Drive Mapping. Highlight the drive you want to map. 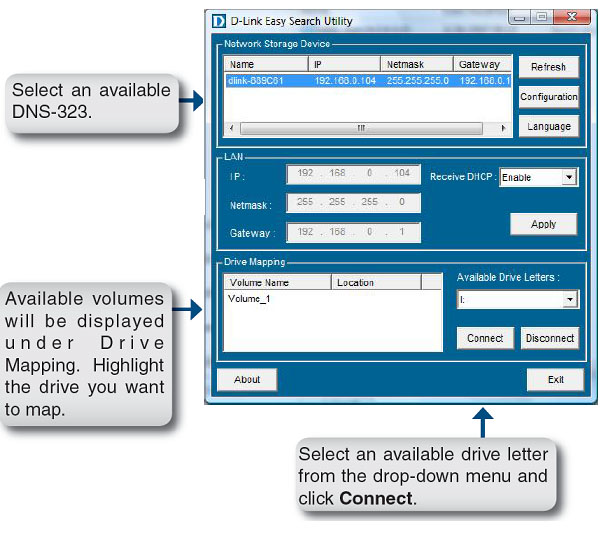 Step 2: Select an available drive letter from the drop-down menu and click Connect. Once connected, your mapped drives(s) will appear in My Computer as network drives.